One of my biggest beefs with Safari on iOS is that when I tap the Safari icon on my Home screen, instead of being able to use Safari immediately, I often must wait for the browser to reload the last page I was viewing—usually hours, or even days, earlier. (This is less of an issue on the iPhone 4 and the iPad 2, as the additional memory in these models means Safari doesn’t flush its page cache as often, but it still happens frequently.) Similarly, if I previously closed all Safari windows, the next time I open Safari, it pops up my bookmarks list instead of letting me immediately enter a URL. In the URL field, type about:blank and then tap Go to “open” that page…which will be completely blank. 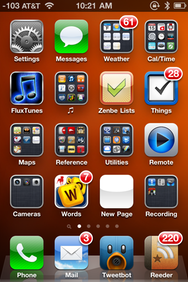 The Home-screen bookmark is saved to your device’s Home screen, where you can move it wherever you like. On my iPad and iPhone, I’ve moved this bookmark to my first Home screen, relegating the actual Safari icon to a folder of rarely used stock apps, where it hangs out with Compass, Notes, and Stocks. Whenever you want to open Safari to view a new page, you simply tap this New Page icon on your Home screen. Safari opens—instantly—to a blank page, ready for you to type a URL or open a bookmark. Another benefit of this tip is that if you were planning to keep currently open pages handy (meaning you were really going to open a new Safari page), you avoid not only having to wait for a page to reload, but also the extra steps of tapping Safari’s multiple-pages button and then the New Page button. And it avoids the aforementioned annoyance of your Bookmarks list popping up on its own whenever you launch Safari after previously closing all Safari windows. What if you want to open Safari to view a previously opened page? You can tap the Safari icon, as usual. Or if, like me, you’ve buried the browser’s icon in a folder, you can simply access Safari from iOS’s multi-tasking dock (by double-pressing the Home button). For me, this approach closely mirrors my actual Safari use anyway: Nine times out of ten, if I want to look at a page already open in Safari, I open Safari from the multi-tasking dock. 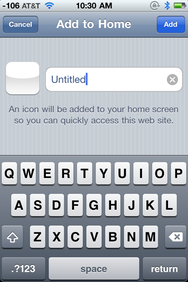 I can continue to do that, but if I want to go directly to a new page, I use my New Page icon on the Home Screen. The biggest drawback to this tip for some people is that the icon for this blank-page bookmark is, appropriately enough, blank. Unfortunately, there’s no way to give it a better-looking icon, since URL-bookmark icons are adapted from each Website’s favicon. An alternate approach would be to publish, somewhere on the Web, a blank Web page with a nice favicon—say, a Safari icon with a blank-page badge?—and then create a Home-screen bookmark to that page. Of course, loading that page wouldn’t be as fast as opening about:blank, but it would likely still be much faster than the current Safari behavior of reloading an older “real” Web page.